Apple has seeded the third beta version of OS X Yosemite 10.10.3 to all Mac OS X developers and non-developers (general public), i.e. OS X Yosemite 10.10.3 Beta 3 (Build: 14D98g). Mac users can update / upgrade / install the latest released instantly for testing and experimenting of various features and functions. 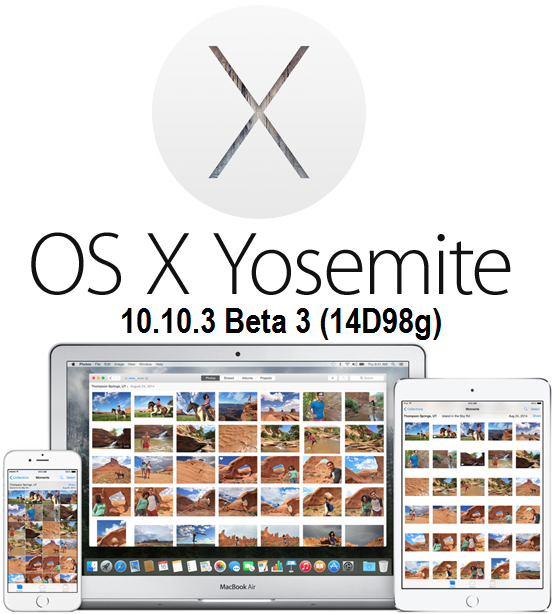 The Direct Download Links of OS X Yosemite 10.10.3 Beta 3 Delta / Combo Update .DMG Files are available below. 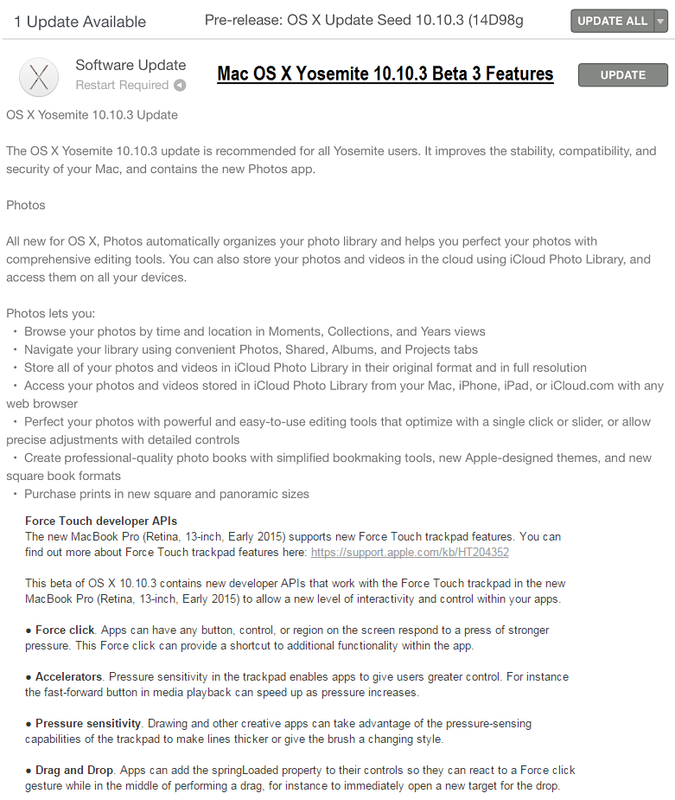 The official OS X Yosemite 10.10.3 Beta 3 (14D98g) seed notes and changelog holds various new functionalities such as; Force Touch trackpad developer APIs, Security and Stability Enhancements, Performance Improvements and Bugs Fixes etc. More detail you can read in below image! OS X 10.10.3 Beta 3 supports different multiple languages i.e. Arabic, Catalan, Chinese, Croatian, Czech, Danish, English, Finnish, Greek, Hungarian, Korean, Malay, Norwegian, Polish, Portuguese, Romanian, Russian, Slovak, Spanish, Swedish, Thai, Turkish, Ukrainian and Vietnamese. How to Install OS X 10.10.3 Beta 3 Update? To get latest OS X Yosemite 10.10.3 Beta 3 Update automatically, just head-over to Mac App Store >> Software Update option. Moreover, All OS X developers can visit OS X Dev Center website for official OS X 10.10.3 Beta 3 Downloads, and all non-developers can manually install and activate OS X 10.10.3 Beta 3 via iTunes without UDID developer account for Free. Just Download OS X 10.10.3 Beta 3 Combo, Delta Update .DMG Files via Direct Links.